Micron and I hit a Reds game at the Great American Ballpark in Cincinnati last month. It was a Bark in the Park event that the Reds, along with Iams and Eukanuba, will sponsor a couple of times a year. 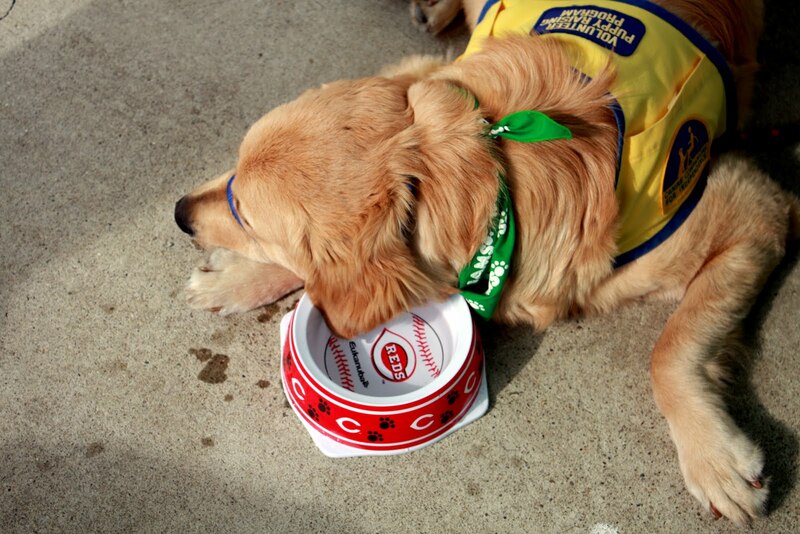 Dogs are invited to come with their human partners to watch the game. This was my second time attending one of these events. 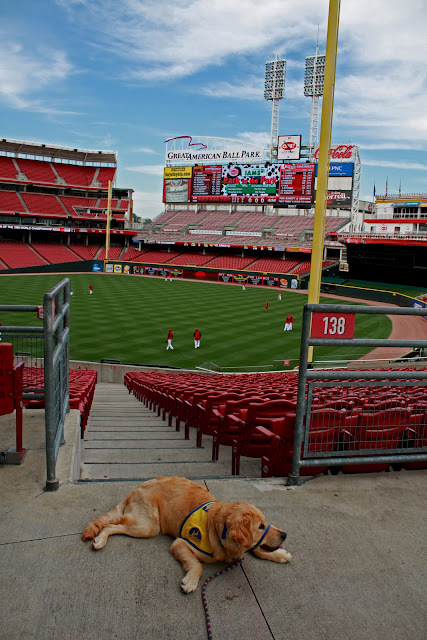 It really is a blast and Bark in the Park is gaining enough reputation that the dog seating was completely sold out for this game. We had signed up to volunteer at the Iams booth; handing out dog food samples and such. I'm not really the outdoorsy type and I do tend to avoid hot, humid weather because it causes me to whine about my hair. But I did sign up thinking, hey it's mid-May. It's bound to be beautiful weather. A pleasant evening to be sure. Yeah, so it sounded plausible for Ohio weather. It was, of course, a hot and muggy evening. Micron was his usual good sport about it all. 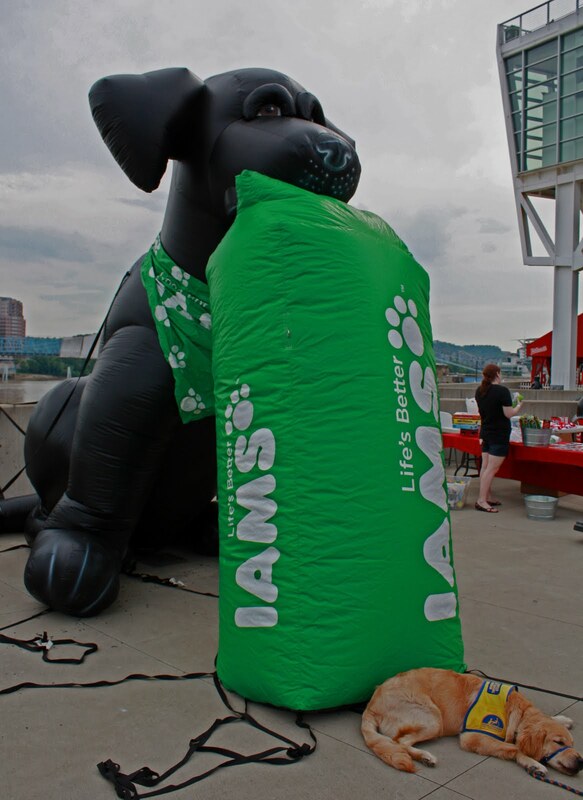 And we did have it better in the Iams booth than the ladies handing out the Iams bandannas under the unforgiving Cincinnati sun. By the end of the evening though, we were all feeling not so fresh, humans and dogs alike. I didn't get any photos of Micron in a position that resembles a state of consciousness. He looks like he's heavily dosed on Benadryl in all my shots from the evening. Which, by the way, is not something I would ever endorse. Don't even think about calming your puppy with an antihistamine. Save that idea for those long road trips with your kids. 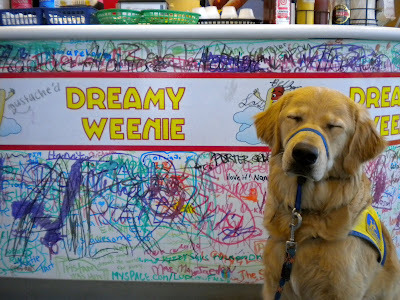 There's a hot dog place near our house called Dreamy Weenie. I've refused to go there based on the name alone. Just something about that name . . . Dreamy Weenie. Just don't sound right to me. Anyway, since we're completely remodeling our insanely outdated kitchen, we've hit every fast food joint in town this past week. Nothing left to hit but the weiner place. Ok, ok, I'll go. But I'm taking the dog. They say it's good to reach outside your comfort zone. That's how you grow and truly enrich your life. And consuming anything labeled a dreamy weenie was, believe me, way outside my comfort level. But dang it, this turned out to be pretty good stuff. I got a Reuben all-beef dog, with saurkraut and thousand island dressing. And fresh cut fries. Real iced tea, too. It was all pretty yum, I gotta admit. But back to the dog. The real dog, not the weiner in a bun dog. Micron showed off his outstanding restaurant manners by turning invisible under the table. Perfect. Before we left, I did get a shot of him dreaming of, well, a weenie of his own. The place is wonderfully graffiti friendly. We grabbed a purple marker and struggled to find a place to fit his name on the wall. And here it is for posterity. If you happen by the Dreamy Weenie in Englewood, Ohio and need to use the restroom, check the wall on the right. Around the height of a dog's head. Micron's left his mark. In a good way. Not the lift his leg way. Let's try to keep all this weenie talk G-rated shall we?